This is the list of the 103 kanji you need to know to pass the JLPT N5 test. 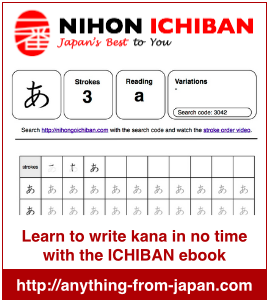 Click on the kanji and watch the video with the stroke order on how to write it and learn from example vocabulary. When you click the “Share” button on top of the page you can also select to print in a printer friendly view (in total 31 A4 pages). Follow this Twitter account to practice the 103 kanji required to pass the JLPT N5. We randomly tweet all 103 kanji once a day with their meaning. You have 二 listed with the readings and translation of “one”. The fact it is underlined so it seems to be 二 but it is not. Whoops! It’s just because it’s been underlined to show it’s a hyperlink. Ignore my last comment. Is there a one time download for gif files? And wouldn’t it be better if you could lead people away from romanji even at this stage? Just a suggestion. I don’t want to appear smug or something. Thanks for the suggestion. I have never thought about a gif download pic packages and will consider it. I agree to you that it is better to start using kana and kanji as soon as possible. But my philosophy is not to impose students how they should learn. It also seams that not everyone is able to properly read Japanese characters on their devices and I do not want to exclude them from using the site. This is why I decided to provide the kanji, the furigana and the romaji wherever possible although it significantly increases my work. Do you have for jlpt n2? The kanji 東 has the wrong link :> Thank you very much btw for this very helpful site!! Thanks for pointing this out. The link now is pointing to the right kanji. Thank you so much for this! Can’t even read katakana and my exam is in two weeks. The pronunciation part really helped! Very useful and helpful for beginners. yeah… its very useful and helpfull to JLPT test. So these are the new JLPT N5 kanjis? Where are the kanjis like 石、糸、。。。? Or was that elementary 1 stuff, and is not related to JLPT? it helps me a lot! I love it!!! I have passed the test!!! hontou ni arigatou gozaimashita! DOumo arigatou gozaimasu, hontouni yakuni tachimasu. I don’t understand the difference between onyomi and kunyomi, .Which reading should I be studying to pass the exam? Hi. Your website is very useful and I love it but I am confused by one thing. Not all the colored kanji in the N5 vocabulary list are are on the list of kanji to know for the N5. Which list should I follow for studying for the N5? Thank you.